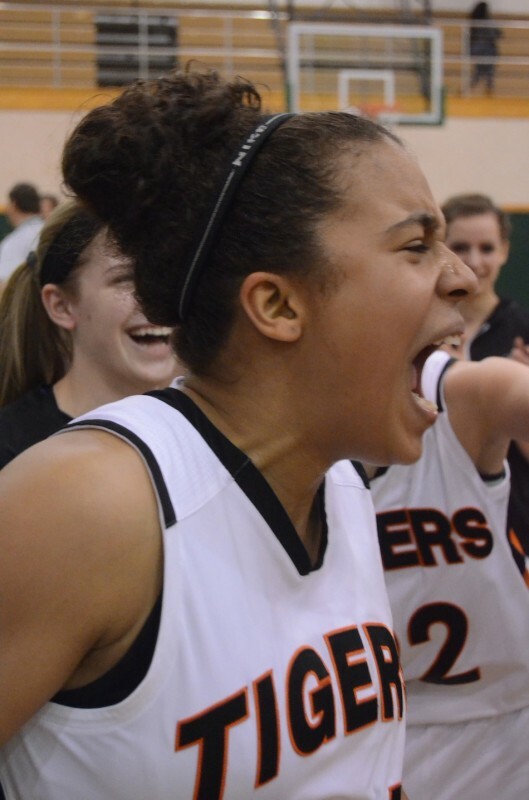 Warsaw’s Brooklyn Harrison screams with joy Saturday night following her team’s 42-41 win over Merrillville to win the Valparaiso Regional. The No. 8 Tigers host Fort Wayne South Saturday in the semi state. The Warsaw girls basketball team will get to play one more game in the Tiger Den this season. The Tigers got the good news earlier this afternoon when the IHSAA announced the semi state assignments for the 16 teams statewide still playing in the state tournament and confirmed that Warsaw will be playing on their homecourt. The No. 8 Tigers will play host to Fort Wayne South Side Saturday in a Class 4-A semi state clash. The game will be the second of two in the North Semistate at WCHS. The first game, scheduled for a 4 p.m. tip-off, pits Eastern (Greentown) versus Fort Wayne Luers in Class 2-A. Warsaw will then play the Archers. Warsaw earned the program’s seventh regional championship Saturday and first since the state runner-up team of 2004 by winning a pair of games at Valparaiso. The Tigers topped Penn 49-42 in the semifinal behind a huge 22-point, 12-rebound game from junior Nikki Grose and then edged No. 5 Merrillville 42-41 in the title tilt Saturday night. Senior Jennifer Walker-Crawford had 19 points and 11 rebounds, while Grose had another double-double with 13 points and 16 rebounds and senior Melanie Holladay converted a rebound outback with 20 seconds left for the game winner in the championship contest. Fort Wayne South captured the Kokomo Regional championship Saturday. The Archers defeated Westfield 57-56 in overtime and then beat Logansport 71-55 to win the program’s second regional title (the other came in 2008). South is 23-3 on the season with losses to Homestead (81-80), Columbus North (57-35) and Bedford North Lawrence (63-39). Warsaw is 24-1 on the season with just a 34-30 loss at NorthWood back on Jan. 26. The Tigers are 11-0 on their home court this season. The Warsaw-South winner advances to the Class 4-A state championship contest March 2 at the Hulman Center on the Indiana State University campus in Terre Haute. They will play the winner of the South Semistate, which pits No. 2 Bedford North Lawrence (26-0) versus No. 6 Roncalli (24-3). Following are the semi state pairings for Saturday. The second games at each site will begin approximately 45 minutes after the conclusion of the openers. Senior Lindsay Baker hugs coach Michelle Harter moments after Warsaw won the regional championship at Valparaiso Saturday night.